It wouldn't be Christmas if I wasn't last minute with creating special things. I thought for sure I wouldn't get a calendar produced for 2013 but somehow I've pulled it off. I need your help though, as I using a different provider and it's not a print-on-demand service. 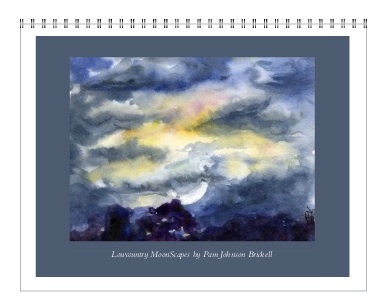 So..... if you would like to own an original, limited edition, ordered just for you.... Lowcountry MoonScapes 2013 calendar, please hit the 'Buy Now' button to the right through Tuesday, December 25th! The calendar is 8.5 x 11 wall calendar with a spiral binding and opens to 17 x 11. The images below are taken from the design page on my computer and show the layout as side by side but in reality, the calendar page sits below the moon painting. I received my sample calendar in the mail yesterday and am very, very pleased with the colors and the stock it's printed on. I've added full and new moon dates based on information from NASA, and they are calculated at Eastern Standard Time. The full moon dates remain the same across the United States but new moon dates in Pacific Standard Time during February and July are one day earlier! Who knew??? The cost for each calendar is $26 and includes shipping via priority mail within the United States. Holidays are also geared to the United States. 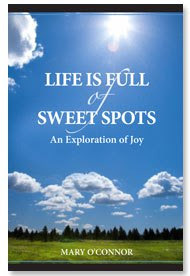 I have to place the order by December 23rd so you should receive your calendar within the first two weeks of January. This is the first time I've used a 'buy now' button from PayPal and I'm not quite sure how it all works. Please send me an email letting me know you've order (pjbartstudio-at-me-dot-com) and included your snail mail address and any special instructions. How exciting! I'm always in awe when I see you post another night sky image. They are fascinating. I just bit the hook and said 'yes' to the 'buy now' on Paypal. I can't wait to get my new calendar. Thanks so, Claire!! The order has been placed! I would love to purchase one of your calendars. Is it still possible to do so? Please email me - link on right side of blog about Stillman & Birn logo. Tomorrow (12/31) is the final cutoff date. I will send you a link to purchase through PayPal. I will be ordering at 5 p.m. 12/31 and will need to have your order and payment confirmation by then. Thanks so!